On April 7-9, 2000 at The American Academy of Arts and Sciences, Harvard University, Harvard Divinity School and The John Templeton Foundation sponsored a symposium on Expanding Concepts of God. The symposium was by invitation only, but two lectures by participants were open to the public: the first by Harvard theologian Harvey G. Cox, and the second, by CESNUR Managing Director Massimo Introvigne, on "There Will Be No Thomas Aquinas at This Table": Notions of God in the New Religious Consciousness. Introvigne was introduced by Lawrence E. Sullivan, of Harvards Center for Studies of World Religions; Harvey G. Cox was the lectures respondent. "New religious consciousness" is a broad concept used by religious scholars in order to identify contemporary religiosity located, primarily in the West, outside the fold of traditional, institutional religion. "New religions", i.e. religions founded in or imported into the West in the 19th or 20th centuries and outside the traditional forms of Judaism, Christianity, and Islam are a part of the new religious consciousness, although the latter also incorporates a non-institutionalised new religiosity (Barker 1998). In fact, statistical surveys indicate, particularly in Western Europe, that there is a growing interest in "religion" and "the sacred" in general. Only a small percentage of this increase, however, benefits institutional religion, either traditional or "new". Almost half of the citizens of the European Union regard themselves as "religious" but do not regularly attend any church. This "believing without belonging" (Davie 1994), paradoxically represents the real majority religious group in Western Europe, is very much a religious "grey" area, and includes varied and contradictory beliefs and practices, incorporating both conventional and non-conventional notions of God. Christianity, of course, is still alive and kicking, particularly in its Pentecostal and charismatic varieties (Cox 1995). However, both in the large area of "believing without belonging", and in the much smaller folds of new religions, non-traditional notions of God are a crucial part of all contemporary religious scenarios. "The only generalisation which can be made about new religions is that one cannot generalise about them" (Barker 1998), 18). They exhibit an enormous variety of beliefs and life styles. The same is also true of non-institutionalised new religiosity, in that it offers literally everything, from seminars on Taoism to more or less genuine Native American rituals. Do all these "new" phenomena actually have anything in common? On October 15, 1989, the Catholic Congregation for the Doctrine of Faith published a controversial letter on prayer and meditation. It was widely interpreted as an attack (inspired, it was widely believed, by theologian Hans Urs von Balthasar) against the use by Roman Catholics of Eastern meditation techniques. In retrospect, the letter included an interesting analysis of booming non-Christian methods of prayer and meditation, considered from a Christian theological point of view. With reference to problems encountered by the Christian Church in its first centuries, the letter mentions two main trends: "pseudo-gnosis" and "messialianism". Christian spirituality, the text argues, is rooted on the idea of "a distance" and a clear "separation" between God and the created human being. New forms of prayer deny this distance and separation, and they do so in two different ways. "Pseudo-gnosis" (as opposed to a legitimate Christian gnosis), or Gnosticism, implies that God can be reached, and the distance eliminated, through knowledge. "Messialianism", on the other hand (the reference here is to a 4th century Christian heresy) aims to reach God through a "psychological experience", the risk being that God may be ultimately identified with that experience through a sense of charismatic enthusiasm. In both cases, although the two approaches are very different, the notion of God is ultimately different from that of traditional Christianity. God is no longer clearly separated from creation (and from the meditating human being), but is part of the human experience, accessible either through Gnostic knowledge or human psychology (Congregazione per la Dottrina della Fede 1989). Whether or not "Gnosticism" (or "pseudo-gnosis") is a valid category in which to place contemporary phenomena is, of course, questionable (see Williams 1996). On the other hand, the 1989 letter does seem to have a valid point when it emphasises the rejection of the distance-separation between God and creation as being a key feature of the new religiosity. We can perhaps go even further and argue that in the new religiosity the distance-separation between spirit and matter is in itself eliminated. Some case studies will further illustrate this point.
" "Intelligence is eternal and exists upon a self-existing principle". Summing up, therefore: "The first principles of man are self-existent with God". And the faithful themselves "have got to learn how to be God", "the same as all Gods have done before you  namely, by going from one small degree to another".
) I understand the philosophical background behind it, but I dont know a lot about it, and I dont think others know a lot about it" (Ostling and Ostling 1999, 296). Other Mormon intellectuals, on the other hand, are not happy with Smiths original theology being played down. They may indeed have a point, insofar as breaching the gulf between Creator and creatures seems to be more fashionable today than it ever was during Smiths lifetime. Just to quote a recent example, we have seen dramatic changes being introduced in recent years into the theology of the Unification Church founded by Reverend Sun Myung Moon (the Church itself is said no longer to exist, having been superseded since 1994 by the Family Federation for World Peace and Unification). One important feature, the liberation of deceased ancestors in view of their subsequent education in the spirit world through ceremonies performed by their living descendants on Earth, bears some resemblance to the Mormon baptism for the death. The increasing importance of numerology is also significant. A "Jeol" is a Holy Day Commemoration in the Unification movement. Rev. and Mrs. Moon, for instance, gave a special benediction at 9 minutes and 9 seconds past 9 oclock on the morning of September 9, 1999. Moons age being 79, the number 9 appeared 9 times, and the day was celebrated as "9,9 Jeol". Number 9 previously "belonged" to Satan and was an evil number, but the 9.9 Jeol ceremony rescued it for God, thereby also allowing the liberation of many souls in the spirit world. 9.9 Jeol was regarded as a connecting point between the "Declaration Day of the Realm of Cosmic Sabbath for Parents of Heaven and Earth" on 7.8 Jeol, and the "Proclamation of the Celebration of Cosmic Victory" on 3.10 Jeol. 7.8 Jeol had been previously celebrated at 7 seconds and 7 minutes past 7.00 hours a.m. on July 7, 1997. 7.8 Jeol was declared as the day on which events capable of re-creating the original world under Gods sovereignty were inaugurated. Rev. Moon proclaimed 3.10 Jeol at 10 minutes past 10.00 hours a.m. on September 19, 1999. With 3.10 Jeol, all numbers from 1-10 were thus restored as Heavens numbers. This was an event of great eschatological significance, because from that moment on God could restore "the original world of creation by numbers" (see Introvigne 2000). These developments also confirmed a trend, already apparent in Moons early teachings. Gods powers were limited or, to be more precise, had been limited as a result of Satans interventions and human unfaithfulness. Without the activities of his representatives on Earth (primarily the Lord of the Second Advent, Reverend Moon himself, and his wife), God cannot recover his sovereignty  particularly, it is now explained, because before the recent "Declarations" God was not able to use certain crucial numbers. Here, the distance-separation between God and creatures is eliminated through a plain denial of Gods absolute sovereignty. As surprising as the Unificationist denial of Gods sovereignty, or Mormon beliefs that "spirit is matter" (Ostling and Ostling 1999, 299), may perhaps appear to outside observers at first glance, non-Christian forms of new religiosity go even further. While there are only a few scholarly discussions of the theological approach of the Church of Scientology (see Christensen 1999), crucial for any understanding of its notion of God is the idea of theta. This is the original ocean of being, and the origin of thetans. The latter are the creators of the universes of matter, energy, space and time (MEST). Thetans ultimately became entrapped in those MEST universes, and forgot that they were, in fact, the creators of them. Scientology reminds thetans of their divine origin and nature, potentially converting each of us again into an "operating thetan". Here, again, there is no distance between Creator and creature; indeed, creatures are creators. A similarly "Gnostic" worldview is found in A Course in Miracles, a book containing revelations dictated by the voice of Jesus Christ to Columbia University psychiatrist Helen Schucman (1909-1981) between 1965-1972. The book has not generated a new religious movement, although study groups gradually operating very much like one have been established in several countries. According to the Course, God "did not create the world" (A Course in Miracles 1986, III, 89); he only created the Son of God. The latter fell asleep, and dreamed of being separated from God. The dream was, basically, untrue, since nothing can really be separated from God. Thus, God called into existence the Holy Spirit, and asked him to awaken the Son. The Son interpreted the Spirits mission, however, as a judgement, against his (illusory) separation from God. As a consequence, the Son, still dreaming, projected his false dream ego onto thousands of egos, all in turn falsely believing they were separated from each other and from God. We are all parts of this dream, badly in need of awakening, all victims of an illusion. Although Father, Son and Holy Spirit are ostensibly Christian terms, the Course in fact, as its apologists recognise (see Wapnick 1989), is not compatible with "biblical Christianity", precisely because it teaches that there is no distinction between God and the Creation  in fact, we are all part of God, and any separation or distance is merely an illusion. The Course has since become the Bible of popular New Age teachers such as Marianne Williamson, although attempts by Christian critics to conclude, on the basis of the Course, that New Age as a whole has a "Gnostic" notion of God are somewhat misleading, because not all New Agers find themselves in agreement with the book. Both inside and outside New Age, increasingly popular notions from the Far East refer to a universal energy, both material and spiritual, which can occasionally (but not frequently) be called God and play very much Gods role. One of these is the Chinese notion of qi, spelled ki in Japan. It is an energy, whose harmonious flow is essential for human health, and learning how to control it may grant competitive advantages in a number of physical activities: hence the popularity of qi-based Far Eastern alternative therapies and martial arts. Of course, not everybody visiting a "Taoist" centre for therapy, martial arts, or physical exercises is ready to embrace a qi-based religious philosophy. Most of these centres, however, also offer classes in meditation or "Taoist philosophy". Some, while emphatically denying being "a religion", do in fact foster many of the ideas and practices normally found in religious systems. Some well-known movements based on the idea of a universal energy have now become globalized religions, or at least quasi-religions: they include Falun Gong from China; Spiritual Human Yoga from Vietnam, and Dahnhak from Korea. Other global movements are much more ambiguous, including Reiki, originally a ki-based Japanese therapeutic system using Buddhist and other sacred symbols, taught however in the West by a great variety of competing schools, some quite secular, and some combining Reiki with other religious ideas. Qi-based well-being systems, and their popularity in the West, are a testament to the ambiguity of the notion of God in contemporary new spirituality. Reiki  as well as the Healing Tao, taught in hundreds of centres inspired by Thai master Mantak Chia  do not claim to bring a new concept of God, but they do shape the personal idea of God held by at least some of their practitioners. These practitioners would not regard themselves as joining a "new religion" based on Reiki or Healing Tao, and may in fact declare themselves to be either secular or non-institutional, non-belonging believers. Radical ideas about God as both the universal spiritual-material energy, or as a limited non-sovereign embodiment of such a universal principle, still subject to destiny and limitation, are also found in todays prevailing pop culture. Movies and TV series create universes for us, in which a God called by that name is nowhere to be found, yet the ever-present suggestion is that there are creators in the shape of aliens from other planets who have created life on earth, for either benign or evil purposes. In its more recent incarnations, the internationally successful TV series, The X-Files, may end up suggesting just this. A daily newspaper recently noted how influential The X-Files currently is in shaping individual religion in Canada (Guly 2000); and there are reasons to believe that this may be true in other countries too. For international teenagers (supported by a loyal adult following), there is Buffy the Vampire Slayer with its spin-off series Angel. The show is about a young girl (Buffy) and a reformed "good" vampire (Angel), both endowed with special powers aimed at controlling evil parading in the form of demons, monsters, vampires, and human bad guys. Buffy is intensely disliked by Evangelicals, and has a pronounced pagan flavour (Buffys best friend, Willow Rosenberg, is a Wiccan). However, there are no clues as to who exactly is in charge of the world. In each generation there is a slayer (Buffy is the current one) appointed to fight evil, and there are Watchers overseeing these young girls (whose life expectation is normally quite short). 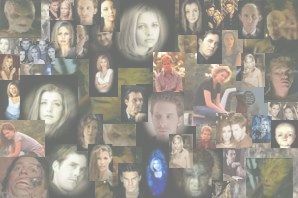 Buffys Watcher, Giles, explains in the pilot episode of the show that: "This world is older than any of you know, and contrary to popular mythology, it did not begin as a Paradise. For untold aeons, demons walked the Earth, making it their home, their Hell. In time, they lost their purchase on this reality, and the way was made for mortal animals. For man. What remains of the Old Ones are vestiges", and this is the origin of vampires and other monsters (Golden and Holder 1998, 126). We dont know who created demons, however, and some contemporary demons are actually not evil. Angel learns that his mission to fight both human and supernatural bad guys is overseen by certain "Powers That Be": they are intractable, capricious, and apparently also threatened by the ever-impending triumph of evil and "end of the days". They are not the ultimate power, however, and in turn mention "that which we serve" ("Angel: I Will Remember You" 1999). This may be some supreme God, (but notice the impersonal "that"), and is at any rate not omnipotent when it comes to preventing the ultimate, apocalyptic triumph of chaos over order. Popular culture, thus, confirms that stories our generation of non-belonging believers (and younger generations) like to tell and hear, are not about secular universes, but involve notions of a Higher Power. These stories, however, more often than not, have no sovereign, omnipotent, transcendent God. "God", or the ultimate Power, may be powerful to an extent, but what is most notably lacking is the distance-separation between God and the world. Either, God (by whatever name), is made of the same stuff, and has the same limitations as humans, or humans are an essential part of the same universal flow of energy we may call God or the Higher Power. From the point of view of institutional religions traditionally dominant in the West, breaching the gulf between creatures and God (or denying that they are "creatures" at all) is clearly objectionable. Although new religious movements (with few exceptions) are notoriously unstable in their coming and going, new religious consciousness, or new religiosity, seems to be a more permanent phenomenon, here to stay. While criticising what they perceive as heresy, older religions should probably bear in mind that the new religiosity is looking for courses rather than discourses, for a holistic notion of God evident in everyday life rather than for theodicy or theology. In a 1999 episode of Buffy ("Buffy the Vampire Slayer: Beer Bad" 1999), college students drink too much beer, discuss theology, and reject the "theology of providence". "There will be no Thomas Aquinas at this table", one of them says. Although this talk by senior students is largely designed to impress Buffy, its content may emblematically indicate the students distance from traditional theology. Supernatural beings may be out there, but traditional theology is not regarded as useful for dealing with them. Proving to non-belonging believers that traditional notions of God may still be relevant in the 21st century is the challenge that lays ahead for all institutional religions. A Course in Miracles. Text. Workbook for Students. Manual for Teachers. 1986. Tiburon (California): Foundation for Inner Peace. "Angel: I Will Remember You". 1999. Episode first aired on November 30, 1999. Barker, Eileen. 1998. "New Religions and New Religiosity". In Eileen Barker and Margit Warburg (eds. ), New Religions and New Religiosity, Aarhus and Oxford: Aarhus University Press, 1998, pp. 10-27. Blomberg, Craig L. and Stephen E. Robinson. 1997. How Wide the Divide; A Mormon and an Evangelical in Conversation. Downers Grove (Illinois): InterVarsity Press. "Buffy the Vampire Slayer: Beer Bad". 1999. episode first aired on February 11, 1999. Christensen, Dorthe Refslund. 1999. "Rethinking Scientology: Cognition and Representation in Religion, Therapy and Soteriology". Ph.D. Diss. Aarhus (Denmark): Department of the Study of Religion, Faculty of Theology, University of Aarhus. Congregazione per la Dottrina della Fede. 1989. Lettera ai vescovi della Chiesa Cattolica su alcuni aspetti della meditazione cristiana. Città del Vaticano: Congregazione per la Dottrina della Fede. Cox, Harvey G. Fire from Heaven: The Rise of Pentecostal Spirituality and the Reshaping of Religion in the Twenty-First Century. Reading (Massachusetts): Addison-Wesley. Davie, Grace. 1994. Religion in Britain since 1945: Believing without Belonging. Oxford (UK) and ?Cambridge (Massachusetts): Blackwell. Golden, Christopher and Nancy Holder. 1998. Buffy the Vampire Slayer: The Watchers Guide. New York and London: Pocket Books. Guly, Christopher. 2000. "Why the X-Files is becoming our new religion". The Ottawa Citizen, March 5, 2000. Introvigne, Massimo. 2000. The Unification Church. Salt Lake City: Signature Books. Larson, Stan. 1978. "The King Follett Discourse: A Newly Amalgamated Text". Brigham Young University Studies, 18:2 (Winter 1978): 179-192. Ostling, Richard N. and Joan K. Ostling. 1999. Mormon America: The Power and the Promise. New York: Harper San Francisco. Wapnick, Kenneth. 1989. Love does not Condemn: The World, the Flesh and the Devil according to Platonism, Christianity, Gnosticism, and "A Course in Miracles". Roscoe (New York): Foundation for A Course in Miracles. Williams, Michael Allen. 1996. Rethinking "Gnosticism": An Argument for Dismantling a Dubious Category. Princeton (New Jersey): Princeton University Press.